The Committee would like to invite you to our final concert for the year: 'Shorts and Suites'. 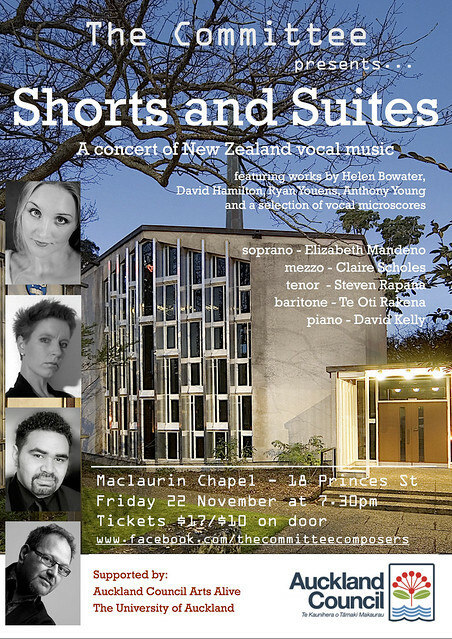 This will be an all vocal concert featuring new and recent song cycles (with piano accompaniment) by Auckland composers, plus a selection of vocal microscores. It will take place on Friday 22 November at 7.30pm, and the venue will be the Maclaurin Chapel on Princes St (next door to the ClockTower). With funding from Auckland Council Arts Alive, we have been able to engage some very fine local performers for this concert. Plus a selection of vocal microscores (1 minute works), recently commissioned by The Committee in a 'call for scores'. Please invite your friends and and family - the more the merrier!